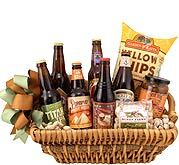 Each basket features a variety of craft microbrews, so your beer gift will never get boring. Encourage your recipient to kick back and enjoy a moment of relaxation, or send it on party day so that they can get the festivities started with a bang. Whether you're sitting across the room or you're miles away, everyone will feel your presence. You make it a point to show up for the people you love, and there's no better way to make an appearance than with six unique microbrews. Five stars for the timeliness of delivery and the nice selection of beers. I gave this basket as a Christmas gift, and the recipient really loved it. She loved trying out all of the different beers, some of which she had not tried before. She had not yet opened the snacks that came in the basket, so I can't comment on those, but the beer was great! I sent this basket to my nephew for his birthday and he LOVED it!! He is a real beer lover so he was very surprised and appreciated all the 6 different micro beers. A BIG hit with him that made him very, very happy!! He sent me a picture and it was done up very nicely too! Thank you so much!! My order was a Christmas gift and was received just as expected. Recipient enjoyed the assortment of beer as well as the snacks included. I've used this website before and most likely will use it again. Very happy. Thank you for correcting an order that was sent incorrectly to recipient. My friend was so delighted with it. You went above and to correct the situation. Very satisfied . Promt delivery . Did not see it myself , but recieved happy feedback about fun an beautiful gift basket. Unable to rate as far as quality of individual products. Arrived on time, Basket appeared as advertised. Easy website to use with a good selection. Would definitely use the site again! I got this for my husband for father's day. He loved it. I will purchase another gift basket in the future. Got this for my sons 35th birthday. He commented that it was a great idea for a gift. Bought this for an office party raffle prize. It's a great basket for the price. Got rave reviews from the recipient of the gift.